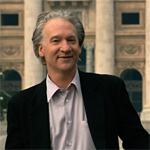 In Religulous, talking head Bill Maher lays out his views on religion. From the title you can probably guess what they are. Religulous is a series of interviews, intercut with found footage and Maher’s asides. In each interview Maher tries to shine a little skeptical daylight into the strange and sometimes harmful beliefs that people hold so dear. Magic Mormon underwear, Scientology science fiction, and the literal belief in parables like the Jonah story may seem like easy targets; yet there’s no shortage of people who believe unbelievable things. Some even think that there’s something noble in it. Some of the saner subjects in Maher’s documentary are Catholics. He speaks with a priest with a great sense of humor who works at the Vatican Observatory (who knew?) who acknowledges that there is no science in the scripture because scripture predates science as we know it by 1,400 years. Another priest with an easy, nervous laugh agrees with Maher that an elaborate and ornate place such as the Vatican is pretty far removed from the Man who preached poverty and sacrifice. But Maher doesn’t go after only the easy targets. He looks at a full spectrum of unbelievable beliefs from the harmlessly silly, to the personally costly, to the downright dangerous. He interviews some Jewish inventors who are in the business of remaking tools like telephones, elevators, and wheelchairs. These are tools that already work — and that’s the problem. Working on the Sabbath is punishable by death; dialing a telephone on Saturday is a deadly sin. But if your telephone is constantly “trying” to dial itself, and by pushing a different button you “allow” the telephone to “rest,” thus resulting in a dialed number ... I’m not sure I follow the logic, but it involves a lot of money, time, and skill, all in the name of working around a non-rational matter of faith. Maher seems particularly baffled by the wheelchair — he wonders why someone should have to go to all this trouble to please God after He took their legs away. That earns him an awkward blank stare from the inventor. Perhaps worst of all is an interview with a Muslim rapper in England; their conversation drifts to free speech. Maher tries to get the rapper to concede to a simple ground rule: that nobody should face death threats just because they wrote a book. But no, even that principle is up for debate; apparently sometimes religion still justifies — to some people — that murder is an appropriate response to words. Notice I was careful to say “sometimes” and “some people.” Maher is not always so careful. When speaking with an activist who says homosexuality can be cured, Maher throws Ted Haggard (who was caught buying drugs from a male prostitute) in his face. This guy doesn’t speak for Haggard, and Maher is wrong to demand he answer for him. Later, he interviews a Muslim who says that Islam preaches peace. Someone on the editing team (Jeff Groth, Christian Kinnard, Jeffrey M. Werner) cuts to a different Muslim preaching violence and hate, tarring one man with the moral crimes of another. In his summary, Maher says “religion must die” before we all end up killing ourselves over religious squabbles. But “religion” collectively isn’t to blame. It’s violent religions, and in particular, individuals who are willing to commit or incite violence, who should be held accountable. The Jew for Jesus who believes Jonah spent three days in a giant fish didn’t advocate blowing up Muslims or atheists. You shouldn’t condemn Garrison Keillor for the crimes of Osama Bin Laden, just because they both believe that a god exists. Nevertheless, Maher is right to call attention to the weird things people believe. His film is a call to action for atheists, agnostics, and non-believers to not be so darned polite when it comes to religion. He wants us to have doubt, to question beliefs not backed up by evidence, and to not let religion get away with flawed logic and bad beliefs, just because it’s religion. With the exception noted above, Maher sets a good example for how to proceed. He is as well informed as many of his subjects, and he doesn’t let them get away with false assertions. He makes them answer for what they believe, and if they are demonstrably wrong, he will tell them so. When it comes to a personal matter of faith, he often lets it go at that, but when facts are involved, he’s aggressive. His challenge may be hard to meet. It’s only natural for some of us to be polite. We respond to strange and unbelievable claims with “oh, that’s interesting” and then quickly try to change the subject. It’s hard to force yourself to say “I disagree; you are wrong.” Maher and the filmmakers seem to recognize this as well, inserting cutaways when Maher seems to be treading on thin ice to illustrate how angry the subject must feel at being challenged by Maher. But good for Maher for being brave enough to question the unbelievable to the believer’s face. Religulous may not change many minds, but it’s refreshing to see someone say “come on, be serious” to the man who literally believes that a snake spoke to the first man and woman 5,000 years ago. Perhaps a little daylight will be good for people who believe weird things.